Miami is a pulsating city on Florida's Gold Coast. Arguably the most exciting city in Florida, Miami is home to a diverse culture and history that you can still see when walking the city streets. Miami is always warm- making it the perfect winter destination. We’ve compiled a list of a few attractions that are a must-see during your travels. When you walk into Jungle Island, you’ll find yourself in the middle of a tropical paradise. The zoo is set up to embody a lush tropical jungle and is home to many wild and exotic animals. Meet Vulcan the 900lb rare Liger, orangutans, marmosets, and more. Jungle Island also has a private beach, so be sure to bring your bathing suit and sunscreen so you can enjoy the gorgeous view of Biscayne Bay. 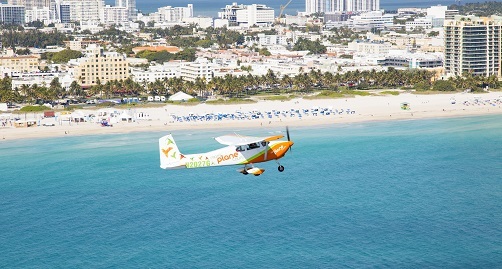 For a thrilling adventure, check out Miami like never before- from the air with Miami Plane Tours. Depart from North Perry Airport, aboard a customized plane that is perfect for tours, complete with comfortable leather seats and bubble windows. Coral Castle is a breathtaking destination with unique American craftsmanship; this attraction is literally a castle with accompanying sculptures and gardens all hand-carved from coral rock. This marvel was the brain child of Edward Leedskalnin, who spent nearly 20 years working on the project. The Wolfsonian at Florida International University is a museum like no other. The Wolfsonian seeks to highlight the power of art and design and its influence on the world during the Industrial Revolution. The collection holds over 120,000 objects, including a variety of media, metal work, and other mediums.